Araatris: The druid bites his tongue over the first thing he wants to say. Instead, eyes wild, he grimaces and turns away. “Fine.” He flies off as the crow. Araatris: “But I would not be terrified for you, because I know you would keep your wits about you, even were I in peril. Rhese…?” She shakes her head. Araatris: “About…?” She turns to look down at him, her brow furrowing as she watches his gaze skim across the camp and then the island beyond. Rhoelyn: “It’s the watery realm of Neptulon on the elemental plane. The only place near where we can enter it is the Abyssal Breach.” He frowns thoughtfully. Rhoelyn: The priest smiles tenderly at her, “I know you will. Let us go rest. There’s nothing we can do at the moment.” He tugs her towards their shelter. Araatris: (c) what to do. Because not doing anything might be getting Nysse and Yami and the others killed. “Lad.” Dorian makes him jump out of his skin. Rhoelyn: “Since then, she’s saved our lives more times than I can count. Yer Nysse not only survived, but took care of two others,” he continues. Araatris: “She isna some fragile wee flower, an’ you know it. An’ sure, you aren’t with her, but she also isna alone.” He pats the night elf’s arm. Rhoelyn: The druid rubs his face. “Why do I feel like a stone wall talking to another stone wall?” He looks out over the water with a long sigh. Rhoelyn: Rhese reluctantly allows himself to be pulled towards camp. He doesn’t speak, but keeps looking over his shoulder. Dorian chatters pleasantly. Rhoelyn: “Have hope. I know it be hard when you feel she’s in danger, but it’ll work out. I can feel it in mah bones.” The dwarf smiles comfortingly. Rhoelyn: Dorian pats his leg, “Aye, these bones have seen a lot. Try to put it outta yer mind and rest. We’ll check on ye inna morn.” He finally steps away. Araatris: “Until then, Dorian.” Once alone, the young man eats in brooding silence, laying down on his side in the soft moss. He stares blankly at the tree. Rhoelyn: Rhese sighs and rolls onto his back. His thoughts and worries churn in his mind like a thunderstorm. It takes a long time for sleep to come. Araatris: When the druid opens his eyes to watch Nysse and Yami playing with the wolf pups in their yard in Nighthaven, it feels perfectly natural. Araatris: He laughs and walks over at a leisurely pace, enjoying watching them. “I wondered where you two had gotten off to.” A couple of the pups bound over. Rhoelyn: Nysse smiles and gazes at him lovingly. “I missed you, too. I’m sure you weren’t too worried about us.” She reaches up to touch his cheek. Araatris: The druid chuckles, reaching out to Yami as the pup bounds over and shifts back to a boy. “Do as I say… not as I do.” His grin is a bit sheepish. Rhoelyn: She taps his nose. “What sort of example are you setting for our Yami?” As Yami joins them, she releases Rhese to lean and kiss Yami’s cheek. Araatris: The child squirms under Nysse’s attention. “Miiiin’da,” he complains, giggling. “Stop!” He ducks behind his adoptive father, full of mischief. Rhoelyn: Nysse giggles and reaches around Rhese. “What? Are you too old for kisses now? Your an’da never complains when I kiss him.” Yami dodges her grasp. Araatris: “Don’t worry, dalah’alei.” The druid grabs at Nysse with a matching mischievous look. “I’ll take all the awful kisses for you.” Yami snickers. Araatris: His tone is sultry as he tugs her close. “The things I do for family.” Yami imposes, grabbing his leg. “An’da!” Rhese releases her to scoop him up. Rhoelyn: Yami giggles and flails. “Play, an’da. Kitty!” He shifts into a miniature version of Rhese’s own druid form. Nysse watches with a bright smile. Araatris: The druid lets him scamper down and bound a few paces away before he shifts and chases after him with a playful growl, tail twitching. Rhoelyn: Nysse laughs, “Don’t let him catch you, Yami. He’s sure to lick you!” Her grin is mischievous as she rounds up the wolf pups to help Rhese. Araatris: Eventually, under playful assault from seven pups and a kitten, the cat begins to flag and lays down in the grass to let them caper around him. 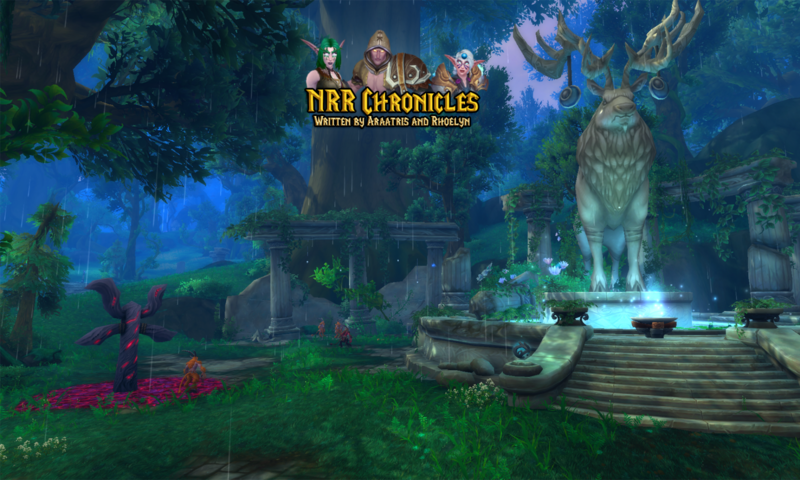 Rhoelyn: The huntress shoos them away and sits next to the druid, running her hand through his fur. “It’s time for me to go, surfal.” She smiles ruefully. Araatris: His expression is troubled as he reaches up and caresses her cheek. “It’s risky. Be careful, my light.” She nods and leans down to kiss him. Araatris: He surges up and gives her a quick kiss. “Be safe, lovely. I’ll find you soon,” he says, the dream fading away around him. Rhese wakes with a start. Rhoelyn: Nithan blinks then frowns. He grumbles, “Fine. Where do you think we should go?” He crosses his arms as if sure that Rhese will be wrong. Araatris: “The Abyssal Breach,” the druid pronounces, watching with no small amount of smugness in his grin as Nithan blinks again. Araatris: “Then we’re agreed, aye?” Dorian puts his rough-hewn stone axe back in his belt. “It seems we are,” Faye says, patting Nithan’s shoulder. Rhoelyn: Sighing, Nithan nods. “Let’s just go already.” He mutters under his breath as they head out, “Really? A dream?” Faye squeezes his shoulder again. Rhoelyn: Rhese grins as they find themselves slipping away from the naga several hours later. He motions toward a circular path to the Abyssal Depths. Araatris: Once they’re clear of the naga forces, Rhese darts through the dark water as a seal, ranging ahead through the rocks before circling back. Rhoelyn: They follow him to the swirling vortex leading to the Abyssal Maw. An elemental that sees them pauses before suddenly ushering them forward. Araatris: The four of them are escorted past a ferocious battle, where elementals and water spirits fight to hold off void lords and fiends as well as naga. Araatris: Rhese starts to turn toward the sound, but their elemental guide stops him, beckoning them farther down the hall. He frowns, but they follow. Araatris: The druid kneels before the majordomo, bowing his head as the others do the same. “It’s about damn time.” The voice isn’t the one they expected. Rhoelyn: He gives a quick bow. “Then we will make sure we’re ready to do our part.” Rhese steps forward and they begin to sort what they’ll need. Araatris: Before long, the druid stands before the window in a borrowed chamber, using his reflection in front of the wild ocean to straighten his belt. Rhoelyn: Nithan grumbles next to him. “Do you think she’s going to be worried about your belt at a time like this?” Rhese shoots the priest a broad grin. Araatris: The druid chuckles. “Let’s go find out. We’ve got work to do, anyway.” He hefts his new mace, testing its feel before slipping it into the sheath. Araatris: They step into a large chamber with a high, domed ceiling of natural rock. Faye and Dorian already wait by the wall, watching the void children. Araatris: Frowning, Nysse opens her mouth to argue, but before she speaks, she pauses and looks at the droopy postures of the siblings milling around Yami. Rhoelyn: She looks dismayed, “I’m sorry, little ones. You’ve been doing such a wonderful job. Of course you can rest.” Nysse kneels in front of Yami. Araatris: The boy yawns and puts his arms around her, leaning his head on her shoulder. “I can take them to their chambers,” Aleesa offers, stepping up. Rhoelyn: Nysse looks gratefully at Aleesa, but speaks to Yami, “Why don’t you all go with Aleesa? I’ll follow in a bit, alright?” She strokes his back. Araatris: He nods and takes the draenei’s hand, his siblings following his lead. On the way out, though, he spots Rhese. “An’da!” He yanks free and runs over. Araatris: Yami smiles and wraps his arms around the druid’s neck. As Aleesa ushers the rest of the children out, Nysse walks over to the two of them. Rhoelyn: Nysse takes in his outfit then yawns. She grins bashfully, “Sorry, I guess I’m a little tired. We’ve been at it since we woke.” She hugs Rhese. Araatris: “I have faith in you, lovely.” He gives her a quick kiss on the cheek and does the same to Yami. “Both of you,” Rhese smiles. Rhoelyn: Yami yawns and lays his head down on Rhese’s shoulder. Nysse sighs, “I should take take him to rest with the others…” Yami shakes his head. Araatris: The druid pats his back, saying, “You need your rest, little cub. And I need someone to take min’da and make her rest, too.” They both look at her. Araatris: Yami nods, but not without his little lip jutting out in a pout. Rhese hands the void child to Nysse, brushing her cheek before he pulls away. Rhoelyn: Nithan rubs his scruffy chin. “It’s actually a solid idea. They can cut off his escape and force him through the portal, but…” He looks at Rhese. Rhoelyn: “I can wait until after she sleeps,” Nithan suggests. Rhese shakes his head. “No, but I’ll go with you. I want to make sure she’s resting. Rhoelyn: Kreston puts a hand behind his head. “Thanks to Yami, they seem to be smitten with Nysse, but you’re right. None of them share the same bond. Rhoelyn: Nithan frowns as the sailor puts a finger to his lips. They step into the chamber on their right. Within, Nysse is circling the room. Rhoelyn: The huntress submits wearily. She settles down with Yami on the pillowed floor and tucks him into her arms. Aleesa hands Rhese a cover. Araatris: They’re both practically asleep in the scant time before he turns and drapes it over them. He sits beside them and beckons Nithan over. Rhoelyn: The human priest carefully makes his wake through the void children and kneels on the other side. He silently extends his hand over Nysse. Araatris: As Nithan’s magic brushes over the huntress, Yami stirs uncomfortably. He squirms over and curls up in Rhese’s lap before falling back asleep. Rhoelyn: He frowns, but continues his examination. After a few minutes, he withdraws his hand and motions toward the doorway. He stands and moves away. Araatris: The druid gently lays Yami back with Nysse and slips to his feet, making his sure-footed way through the sleepers to the doorway with Nithan. Rhoelyn: Rhese pauses, “Is everything alright? I just wanted to see if you were going to head back to the others or stay here.” He crouches next to her. Araatris: “We have the two who stand the best chance of convincing her right here.” Nithan’s gesture encompasses them. Rhese and Aleesa both wince.